YOUR UP-CLOSE DETAIL WORK AND LONG - DISTANCE VIEWING IS NOW A BREEZE - The sturdy headlamp body tilts up to 90-degrees, allowing you to focus light where you need it. Plus, the 3 light modes ensure you get the exact level of brightness you need for any use through single button control. WATERPROOF AND DURABLE - why equip yourself with anything but the best and most reliable headlamp? Genwiss Headlamp is built to last. It is rated to IPX5, which means it is protected against splashing or spraying water from any angle. LIGHTWEIGHT AND COMFORTABLE - Genwiss Headlamp has an easily adjustable, ultra secure headband that won\'t loosen up or flop around., ergonomically designed elastic headband makes this light perfect for long distance runners or anyone else looking for a comfortable fit. 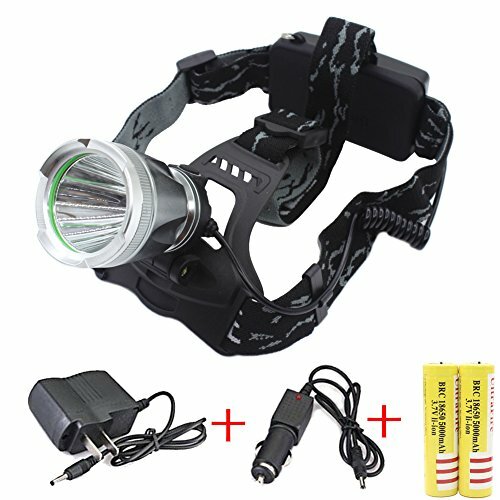 COMFORTABLE AND STABLE - Comfortable bright light and stable in use, Adjustable band made of aluminum alloy and rubber, which holds the light on position comfortable and stable, Best headlamps for adults & kids Man & women - running, walking, fishing, hunting, hiking, cycling, reading, caving, DIY projects, auto repair & emergency kit. All type of construction work, Perfect gift for family & friends, order 2 and give one to your friend! 100% SATISFACTION, NO QUESTIONS ASKED MONEY BACK GUARANTEE - we are so confident you will love our headlamp that we offer money back guaranty with complete lifetime warranty. Click \"ADD TO CART\" button now and have your Genwiss headlamp shipped today!